Sonic the Hedgehog is a Sega Genesis game in the Platformer genre. 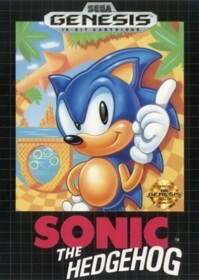 The game was published by Sega and developed by Sonic Team. The game has an ESRB Rating of RP Rating Pending and was released on 1991-06-23. The game's official site can be found at www.sega.com. This was and still is one of my favorite game series. Sonic the hedgehog was one of the 2 main mascots of the 80s/90s. This game featured very smooth scaling and fast processing and speed for the time. The game is a platformer type game with an emphasis on speed. You guide sonic the hedgehog through each level and try to collect as many rings as you can on the way. You can even complete bonus levels to try to attain the elusive Chaos emeralds :). The bosses of this game are all very fun and huge for the time. The graphics are very nice, colourful and well drawn. The coolest part of this game however is the music. The music is just so catchy that you will be humming it hours after you stop playing!